my little red suitcase: Catching up! I am ever so behind with my 52 weeks of happy! Of course there are always ups and downs amongst the happy, but for me the things I notice I am enjoying really seem to follow the season..... Oh and with an occasional bit of thrift thrown in too! Enjoying the warmth of the wood burner. I am very lucky to have this I know. I think it's originally from Norway, it's such a treat. 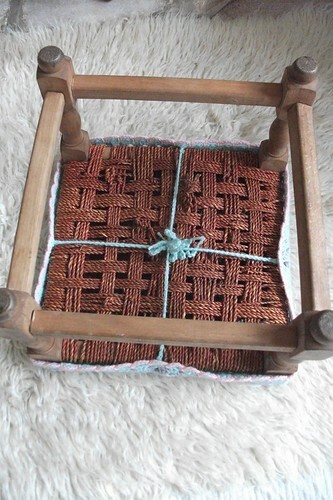 My little fireside stool, more about this in a minute. It's so handy to sit on and make up the fire! 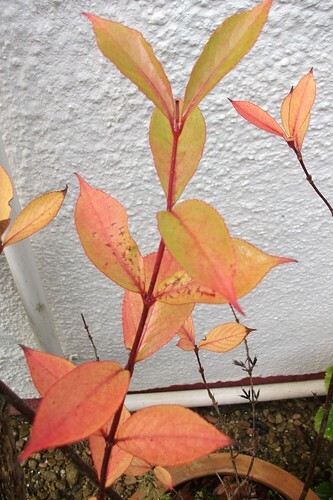 The stunning colour of the leaves outside my back door. Just amazing. 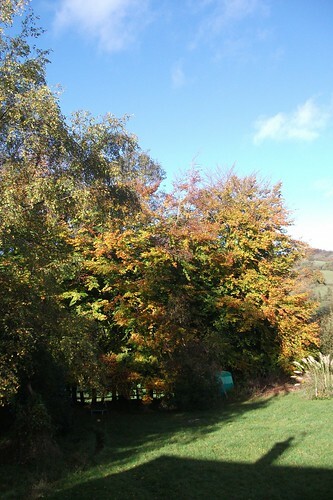 The Beech trees at the end of my garden are starting to do spectacular things. During the summer they are a huge wall and now in the winter the views across the valley will open up. Yes you might notice a very old caravan there at the bottom of the garden. I think it's been there forever. One day.....I might tackle it! This stool cover was very easy to make. I always seem to have a stool like this around and you can pick them up quite cheapily second hand. It's certainly cheered it up! This is how I attached the cover underneath. Well off to put my feet up and warm my toes. I have a finished cowl to show you soon and just the border to go on the second one. Loving making these. A good weekend to all! Your house does look so cozy, I bet that in the evening when the lights are low it's just divine in there, a flicker from the fire and warmth with the smell of wood burning... It must be lovely! Heather your wood burner is so beautiful! I think your little stool (so nice with all these grannies!) matches perfectly with it : they are a great couple!! Great happy things, love the wood burner and the views from your garden - beautiful! 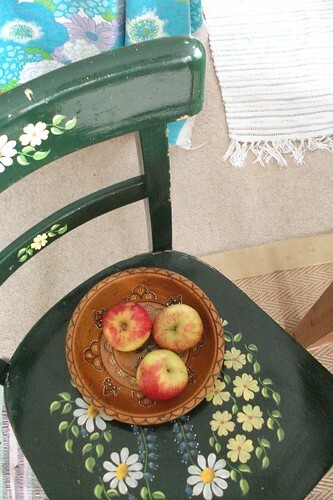 Very pretty stool. Would look great at a beach or pool. Am real envious of your views n autumn leaves! yep that wood burner would make me happy! 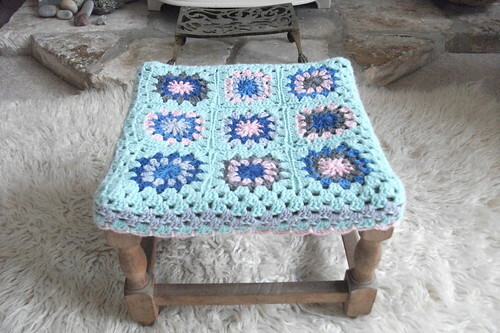 Love the little blue crochet cover - it is really pretty. Have a lovely weekend. You have a little caravan in the back of your yard?!! Can I come over and play? 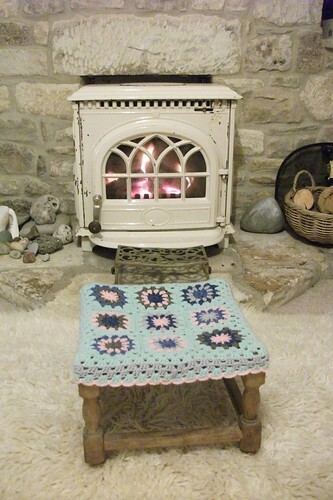 : -) Very cozy and cute fire and what a sweet crochet stool! What a cozy abode. You've put me in the mood to curl up with a book and satellite radio. Acoustic music. Rather like having someone right there, playing for you. I am imagining the wood smoke too, although I have lots of scented candles burning. Happy Sunday.